We offer safe quality programs for teams of all ages to build trust and encouragement. Our team building classes at the Wonderland Camp and Conference Center include free and year-round activities for families, friends, and corporate organizations. 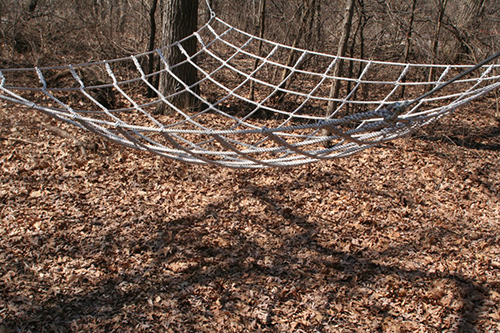 Some of our popular programs include using the cargo net, boardwalk, swinging logs, monkey tails, and so much more. The Salvation Army Wonderland Camp and Conference Center has adventures for everyone throughout the year. We offer a high-quality safe program that will stretch and challenge each individual going through our unique high adventure course that takes you over 30 feet above the ground on elements based on working together and building trust. You will not only have to rely on each other to solve the situation but a great amount of trust will be developed and encouraged in order to complete each task. 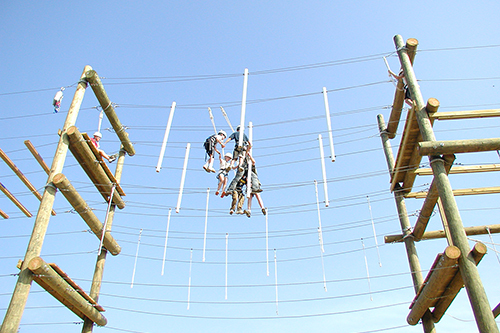 *Full Day program combines both Low and High Ropes Challenge Courses and includes lunch. Wonderland Camp?s Low Ropes Challenge Course consists of both social interaction and group dynamics. Our challenge course has been designed primarily for 8 ? 17-year-olds but can easily handle and challenge all age groups. The main emphasis of the course is on problem-solving within a group. The goal is for the group to cooperatively solve (encounter and conquer) each obstacle using brainstorming, great communication, cooperation and positive thinking. Open to all with availability. Requests for programs require a 21-day minimum for scheduling purposes. All are subject to availability and weather permitting. Waivers are required on all participants.